Alderman Roger Gifford has been sworn in as the 685th Lord Mayor of the City of London. He will be the global ambassador for UK-based financial and business services, as well as serving as the Chancellor of City University London. The new Lord Mayor will lead business delegations overseas and welcome international politicians and business leaders visiting the City of London. Thousands of people lined the streets on Saturday as Alderman Gifford travelled from Mansion House to Westminster to swear allegiance to the Crown. His carriage was preceded by an 800 hundred year old procession known as the Lord Mayor's Show. City University London was represented at the event by a vintage route master bus carrying thirty five students, as well as staff members, in academic dress. Samba music was provided by 'Rhythms of the City', a band made up of City music students, academics and alumni. 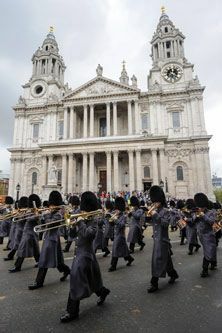 Forming at the London Wall, the procession made its way through The City of London to The Royal Courts of Justice, before returning along the Victoria Embankment to The Guildhall. Alderman Gifford arrived ahead of the parade on the royal barge Gloriana. It was the boat's third official outing this year following the Jubilee pageant and Olympic torch relay. "City University London is the university of the City of London and we are proud to have the Lord Mayor of London as our Chancellor. We look forward to installing Alderman Roger Gifford as Chancellor and to working with him during the coming year." Alderman Gifford is a former Chairman and current Vice-Chairman of the Association of Foreign Banks, which represents all foreign banks based in London. In 2004 and 2011, he was elected as Alderman for the Ward of Cordwainer. He was also Sheriff of The City of London in 2008/9.